If you’ve read the story of our traumatic Monday, then you’re familiar with the loss of a dear family member, Jahmal. In the days since we took Dexter to the vet and recently called Birdie 911 for Jahmal, I’ve learned more about parakeets than I thought I would ever learn in my lifetime. ~They also go by the term ‘Budgie’. ~They get incurable liver disease. ~You can’t 100% tell the gender of the bird without a $40 blood test (apparently they have no obvious differences, if you know what I mean ). Yeah, like I’m going to terrorize the human Engledows and the avian Engledows for that detail! ~You can make a reasonable assumption on the gender of the bird by looking at its beak. If there is blue across the “bridge of the nose” so-to-speak, then the bird is male. If that area is brown, it’s female. The Bird Vet said that the beak test is not 100% accurate due to in-breeding and such, but it’s used as a reliable indicator of gender. ~Their beaks and claws grow like finger nails and need trimmed if they have incurable liver disease (otherwise, good grooming materials in the cage for healthy birds takes care of that problem). ~If they’re sick, they won’t display it until it’s critical and too late. It’s ‘Survival of the Fittest’ – the weakest birds get eaten in the wild (Where on the planet are there wild budgies? Rain Forest?). So, saving a sick bird seems highly unlikely given that info. When talking to the Bird Vet, I jokingly said, “So what would you have done for our bird? CPR?”. She answered in the affirmative – if it’s warranted, they’ll do it. I’m still trying to picture that one. To help my Miss Maddie get over her sadness, we went to the pet store to get a new buddy for Dexter. They had yellow/green ones (we already had one like that! ), so we went for the bluish ones. Since we were limited to males (why? Dexter is male and I don’t know nuthin’ about birthin’ no baby birdies! ), we used the beak test to pick out likely candidates. There were really only two options (they had a lot of females!). There was a low-key one, just hanging out not bothering anyone and then there was this crazy one, picking on the girls, biting on others’ tails. Maddie opted for the low-key one considering that Dexter is sickly and on his way out. It wouldn’t be fair to choose a cage-mate that would literally torture him until his dying day. Our newest addtion is adjusting to his new home nicely – he has started chirping (we were a little worried about his silence) and he and Dex seem to be buds now. The picture in this post is of Dexter (flying off) and our new blue budgie, John. John? Well, that’s that! Welcome to the Engledow family, John! 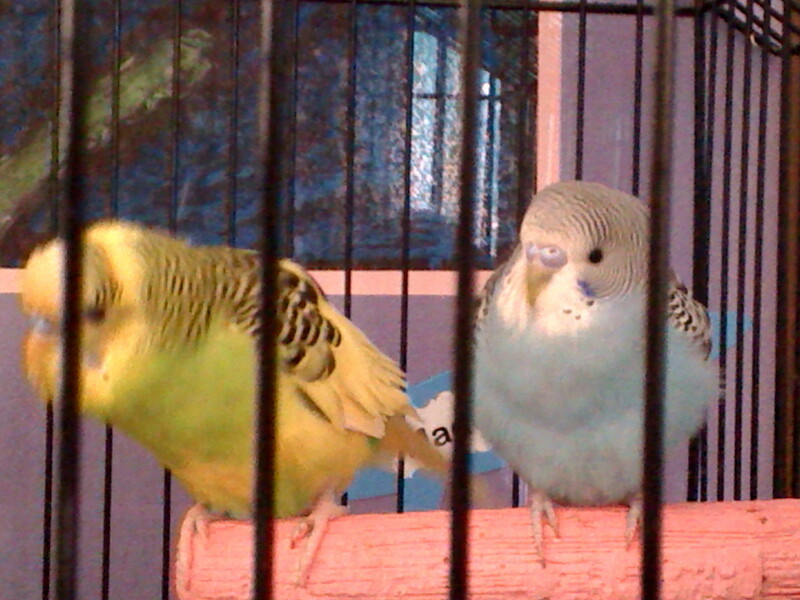 This entry was posted in Everyday Life, Parenthood and tagged birds, budgies, New pets, parakeets, postaweek2011. Bookmark the permalink.